Last season, from June 13 through June 20, the Yankees lost seven-straight games to the Angels and A’s. Two of the losses were walk-off losses and four of the losses were by one run. After that awful stretch, the Yankees then lost four of their next seven to the Angels, Rangers and White Sox. They weren’t exactly losing to good teams, but even despite their miserable two weeks, after their 4-3 walk-off loss to the White Sox on June 27, they were still 41-34 and only trailed the Red Sox by one game in the AL East. 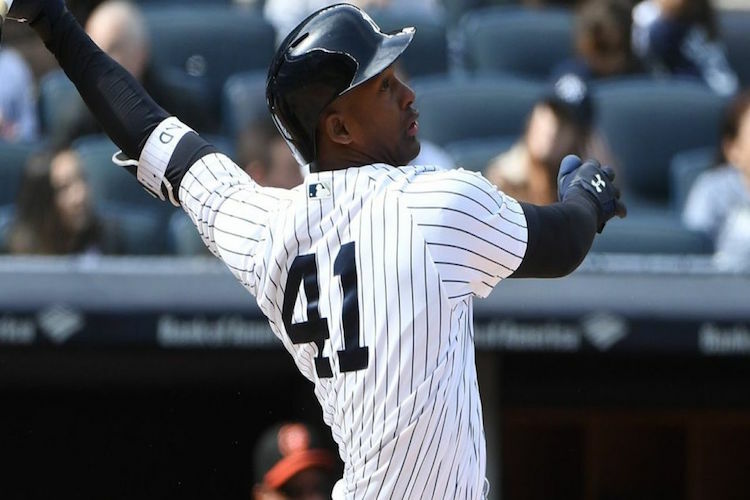 On June 28, the Yankees called up 22-year-old, highly-regarded prospect Miguel Andujar for his Major League debut. He was penciled in as the DH and to bat seventh in the lineup. In his first at-bat, he produced a two-run single. In his second at-bat, he hit another single, which would have been for a third RBI, but the slow-footed Chase Headley was thrown out at home. In his third at-bat, he grounded out. In his fourth at-bat, he walked. In his fifth at-bat, he lined a two-run double to center field. His Major League debut: 3-for-4 with a double, a walk and four RBIs. With top prospect Gleyber Torres needing season-ending Tommy John surgery from an injury suffered the week before, and with Headley once again struggling, the Yankees might have found their everyday third baseman. Though his defense was still a work in progress, which is why he was the DH for his debut, the kid could mash. Andujar was sent down after the game and wouldn’t return until September as a mid-September, late-season call-up. I wanted Andujar to be the Opening Day starting third baseman for the Yankees in 2018, but the late-February trade for Brandon Drury ended that. Despite showing off his bat in the early going of spring training with a home run in seemingly every at-bat, Andujar’s defense was still being questioned and he was sent to the minors to begin the season. But it didn’t take long for the injuries to mount and Andujar was on the Yankees in their first series of the season against the Blue Jays. Andujar went 0-for-4 with two strikeouts in his season debut, which was the Yankees’ fourth game of the season. He didn’t play again for four days when he made his Major League debut at third, going 0-for-3 with a strikeout. The next day, he was back at DH, and he went 0-for-5 with a strikeout. Andujar was now 0-for-12 with four strikeouts to begin the season. The following day, Boone put him back at third base and he went 1-for-3 with an RBI and hasn’t stopped. Over his last seven games, all as the starting third baseman, Andujar is 9-for-28 (.321) with four doubles, a triple, a home run, five RBIs, two walks, two strikeouts and .998 OPS. Four of those seven games have been multi-hit games, including the last three. His last at-bat on Tuesday night against the Marlins was a long home run (his first of the season) to left field that prevented the Yankees from being shut out for the first time this season. Andujar has gotten hot, and I figured that the Yankees would plan on keeping him at third until Drury gets healthy (if he does) and have Torres come up to play second for the struggling Tyler Wade. Instead, the Yankees’ plan on Thursday night against the Blue Jays was to not have Andujar in the lineup at all. Because of the need for Giancarlo Stanton to DH that leaves only third base as an option for Andujar now that Aaron Hicks is back. Ronald Torreyes got the start at third base on Thursday, so that meant the bench for Andujar. If you Aaron Boone or Brian Cashman or whoever actually makes the Yankees lineup wants Torreyes in the lineup then it has to be at second base for Tyler Wade. It can’t be at third base for Andujar. I have been as high as anyone (though I’m not sure there’s actually many people high on him) on Wade’s ability to be a full-time Major Leaguer, who can play nearly every position. Last year’s .155/.222/.224 in 63 plate appearances was easy to chalk up to Joe Girardi sitting him for weeks at a time, but this year it’s much of the same at .086/.158/.143 in 38 plate appearances. I bought Tyler Wade stock at $7 and it’s now at $0.29. It’s likely that Wade needs to play every day and get consistent at-bats to be productive, but in a season in which the Yankees already trail the Red Sox by 6.5 games, the Yankees can’t afford to have an automatic out at the bottom of the lineup, waiting and hoping he gets going. Since Torres is playing third base every day in Triple-A, it’s obvious the Yankees’ plan is to have him come up as a third baseman, move Drury over to second where he has played the majority of his career, and have Neil Walker and Tyler Austin as a platoon at first until Greg Bird is back. That would make Andujar the odd-man out since the organization clearly favors Drury over him (though I’m not sure why), and it will likely be Andujar who’s no longer a Yankee at the end of July if the team needs starting pitching help. Once Torres is up and Drury is healthy, it’s back to Triple-A for Andujar to work on his defense and continue to not work on his hitting since there’s nothing offensively he can learn anymore in the minors. As long as Andujar’s in the majors, he needs to play. He’s a consensus Top 5 prospect in the organization with nothing left to prove in the minors. Having him on the bench is idiotic. Giving him a rest as a 23-year-old on April 19 is absurd. He’s not going to get better playing defensively by not playing, and if you want to pull him for a late-inning defensive replacement, go ahead, that’s what Torreyes is there for it. But not playing him the night after he crushes his first home run of the season and is arguably the hottest hitter on the team is irresponsible. Yes, the Yankees won on Thursday night. Yes, they’re back over. 500. But Miguel Andujar needs to play. He needs to play every day as long as he’s a Yankee.